Compatible with blank check paper from most suppliers such as VersaCheck, Deluxe, and NEBS. Compatible with Laser Printers (and includes a unique "toner lock" security feature that prevents someone from tampering with the printing) and Ink/Inkjet Printers. We use a premium quality check paper that won't jam in your printer like thin, cheap check paper will. Blank Check Paper from ASAP Checks includes extensive security features. If you are Re-ordering the same product, save time by signing in here. Can You Guarantee the Quality of Your Blank Check Paper? When printing checks, nothing is more frustrating than jammed paper. It interrupts the printing process, causes you delays, and potentially gives rise to errors. So we use only premium check paper that won't jam in your printer as low-quality paper does. This ensures you benefit from the fast, smooth, seamless printing process that high-grade paper provides. We're so confident about the outstanding quality of our paper, that we offer a 100% refund if it isn't fully printer-compatible or it doesn't meet your expected standard. Premium paper and a no-hassle refund policy mean exceptional value for money and trusted service. Furthermore, we don't skimp on the security features that we add to our check paper. When it comes to your checks, we take your security seriously. For this reason, we utilize many of advanced techniques to prevent tampering and fraudulent activity. Not only is our blank check paper guaranteed to be compatible with laser and ink/inkjet printers, but it also includes a tamper-resistant toner-lock feature so that the printing cannot be altered in any way. This means accurate results every time and total peace of mind for you. Do You Offer Different Formats for Blank Checks? 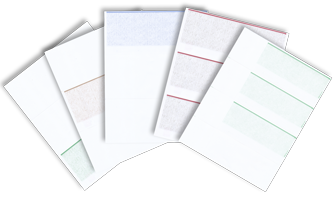 Our blank check paper is available in several formats: Voucher Checks, Standard Business 3-Per-Page Checks, and Wallet 3-Per-Page Business Checks. This variety allows you to use the type of check that is best suited to your business or personal needs. No matter which option you order, we guarantee you will receive only high-quality premium blank check paper. What are Blank Voucher Checks? Also known as accounts payable and payroll checks, voucher checks have one check on the page and 2 vouchers/stubs (one for sending with the check, the other is kept for your records). The payable check part can be at the top, in the middle, or at the bottom of the page, depending on your needs and according to the software package you use. What are the Options for Blank 3-Per-Page Checks? We offer 3-per-page blank check paper in Standard (Business), and Wallet sizes - both of which are hugely economical as multiple checks can be printed on each sheet of paper. If you decide to order this option, you will first need to ensure your computer software supports the 3-per-page style to avoid any printing errors. How Fast Will I Receive My Blank Business Check Paper? We pride ourselves on our exceptional customer service and speedy, reliable shipping. We prepare your order, package your products, and ship fast - without compromising on quality at any stage. Most purchases are shipped within just 1 day, so you can place your order and get back to business. This fast shipping time means you won't be left waiting on deliveries and you won't suffer any hold-ups within your payroll or operations system. You'll experience all the advantages our professional service offers. Also, returning customers can benefit from our secure, time-saving reordering system. If you wish to place a repeat order for the same product, you can sign into your customer account to speed up the process. This applies to either a one-time repeat order or a regular order. With your unique customer account, there's no need to memorize the details of your last purchase and no potential for errors such as ordering the incorrect product. Want professionally printed blank check paper but can't afford to wait around for your order? For premium black check stock for business checks shipped within 24 hours of ordering - trust ASAP Checks. I so love the convenience of using ASAP checks. I have gotten my daughter to use them too. The web site was pretty easy to use. I was able to reorder my checks quickly. The checks arrived quickly and were printed correctly, as usual.